Woodwick Candles (Virginia Gift Brands) is a company with a candle concept that is quite popular – they are the home of the original woodwick candle – wicks that crackle as they burn. I have to admit the concept is attractive… that a candle will sound like a fireplace at home while burning is pretty cool. In fact, the soft crackling sound of the wick burning really does mimic a fireplace–albeit, a quiet one–while it’s burning. This brand offers tons of different types of containers, such as this mosaic glass one I‘m reviewing, mercury glass containers, their standard hourglass staple candles as well as many different shapes (for example, an umbrella-shaped candle), in lots of sizes and scents. They also frequently change things up so there are new offerings on a regular basis. And, there are great coupons offered several times a year. With all this going for them, I just can’t resist! What did my Strawberry Parfait candle look like? This mosaic glass candle is unique in its presentation and attractiveness. It boasts a heavy, high-quality container with an irregular pattern of glass pieces on the side. There is a repeating pattern in smaller glass pieces of what I would best describe as a large bird with open wings, though the overall effect is somewhat abstract. The wax for this scent is a lovely, medium pink: like a medium rose color. Very pretty! My only criticism of the appearance of these is a makeshift lid: a piece of plastic which is taped to the glass on the side with a small piece of silver tape. The company’s name is on this piece of plastic. I thought a nicely-presented candle such as this deserved something better than this lid! On the bottom, a small sticker includes the scent name and standard warning information. There is one wood wick in the center. Overall, I love this container and have recycled them after burning and cleaning out the wax. I use these for pens, small objects, coins, etc on my home desk. I love sweet things in general (how many of us don’t??) and this description was really tempting. Cold sniff was great… sweet and fruity as expected! I burned this goodie in a 10×12 room and started to smell it well after about 1-1/2 hours. It filled most of the room with a sweet strawberry scent which I truly loved, especially the creamy “whipped cream” part which was a stronger-than-expected component. Rather than the strawberry with a touch of cream, it was more of a cream with a little strawberry! Either way, they are both scents I like, and this was no exception. Strength – I would say it gave a medium throw. This candle did scent most of the room I had it burning in though quite lightly at its periphery. The scent didn’t really waft out of the room, even with an open door. If you are either a sweet or fruit/strawberry scent lover, this should do the trick! This candle performed quite well. The wick crackled nicely, with a light “fireplace”-like sound, and without being too intrusive. The candle burned for about 55 hours, and with wick-trimming every 4 hours or so (you can break it off carefully with your fingers), there was no soot. It burned very cleanly on the sides, leaving no wax at all. I was able to sweep out the tiniest bit attached to the metal piece at the bottom with the wood wick and plopped the nice container on my desk for further use and enjoyment. I loved burning this sweet and creamy delight! I already knew I liked the wood wick sound, so that was no surprise. The strength of this candle was not super-strong, which I typically like, but it was fairly good. If you have any scent sensitivity and require lighter strengths, this would be a great choice for you. The performance was excellent, and what a great bonus to be able to use the container after burning the candle! If you haven’t experienced the crackling-wick effect, you should consider giving this brand a try. And for fruity and cream-sweet scent lovers, this is highly recommended. Enjoy! 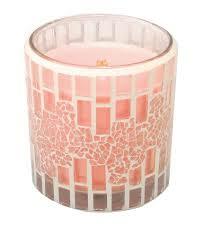 Have you tried Strawberry Parfait Mosaic candle from Virginia Candle Brands? Review is with Ann! 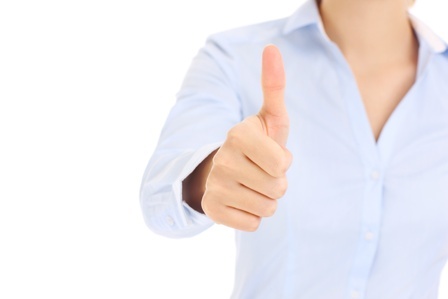 It’s easy… simply post your review and star rate your experience in the comment section below. 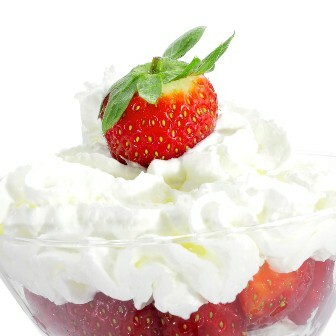 Strawberry Parfait - A sweet treat of sugared strawberries topped with fresh whipped cream. This candle is so pretty and unique. I have lone unit I keep in my bathroom as just decoration.